Every work zone project in California has its own challenges. The possibilities range from crowded conditions to inclement weather. But the one challenge that seems to emerge on a consistent basis is how to deal with right-of-way encroachments. If you’re a decision-maker facing this issue, Roadway Construction Service can make your life easier. Through experience and skill, we’ve developed a sophisticated system for the acquisition of temporary encroachment permits in California. This system, we’re pleased to say, consistently delivers. Why do we excel in the acquisition of temporary encroachment permits in California? There is no one answer. But if we had to narrow it down, the greatest share of credit should go to our encroachment acquisition team. Like any championship team, our encroachment specialists balance knowledge and experience. Bolstered by these two strengths, they efficiently evaluate needs and match each one with the proper solution. Our team’s experience offers another notable advantage – namely the personal edge. It works like this: We’ve been at this game for a long time. Consequently, we know many of the key decision makers throughout Southern California. (We’re adding to the list all the time, by the way.) The upshot, of course, is that we understand their expectations and therefore can anticipate and formulate appropriate solutions. Ultimately, this means we skip past the tangle of bureaucratic red tape, which often leaves other providers stuck in the mud. These expedited encroachment permits offer a big bonus to clients — a drastic reduction in wait time, and an extraordinarily high likelihood of starting on time. The efficient acquisition of encroachment permits helps set the stage our other temporary traffic control services. When it comes to the efficient maintenance of traffic, these services are the best on the block. Consider, for instance, our approach to lane closures. For these, we employ a combination of seasoned professionals and precision-selected hardware. Leading the hardware group is our selection of traffic barriers. These come in a wide range of shapes, sizes, weights, and colors. Traffic cones are the most compact of our traffic guards. Although small, they can be seen from a great distance thanks to their bright coloring (typically orange). Because of their glow, they easily reflect light – a plus for nighttime duty. When sheer strength is a priority, we deploy the finest in large traffic barriers. The biggest and mightiest in the bunch is our k-rail (or Jersey wall). Designed to restrict traffic from unauthorized areas, k-rail may be made of concrete or water-filled plastic. In selecting these or any other barricades, we thoroughly evaluate each situation before committing to a choice. Invariably, the result is precision deployment and greatly enhanced safety. 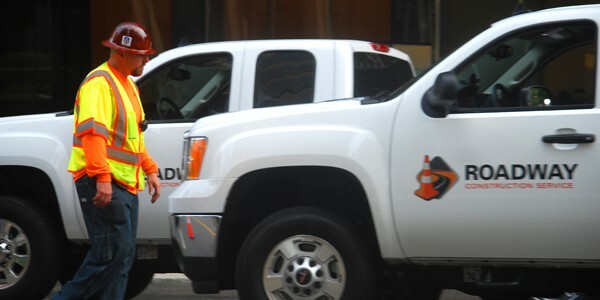 Traffic signs also form a vital component of any work zone traffic control strategy. As with other hardware, they are carefully chosen to maximize safety and efficiency. Flaggers provide the needed dimension of human expertise to every lane closure project. Trained to the highest level of competence, every one of our traffic control flaggers is qualified by the highest certifications, including OSHA. 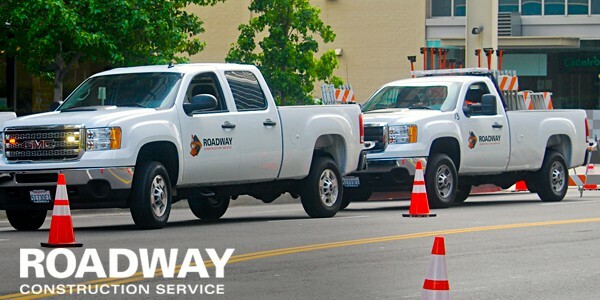 Roadway Construction Service combines these services with efficient acquisition of temporary encroachment permits in California. Consequently, we take traffic control to a whole new level. Rest assured, however, that at Roadway Construction Service, we’re always aiming to take that level even higher.